It is just an old white trellis, the wooden kind that fans out. I found it for $15 at an antique mall. I wasn’t quite sure at first what I was going to do with it. First I set it up against the wall right side up. No, I didn’t like that. So I turned it upside down. Yes, that would work. In the back of my mind, I knew what I wanted the trellis tree to represent. I stood back and mulled the situation over. Yes, I could do something with this. Back in my younger days as a freelance journalist, I wrote a lot of tough articles. The hardest of all were about missing children who were never found. And the children who fell victim to predators. They all still live in my heart. I will never forget their bedrooms. I can’t rid my mind of the young bodies so carelessly tossed in a ditch. They were just abandoned beside the road for all to see, like trash. How can one ever forget such things? And what kind of animal that walks among us could commit such heinous crimes? 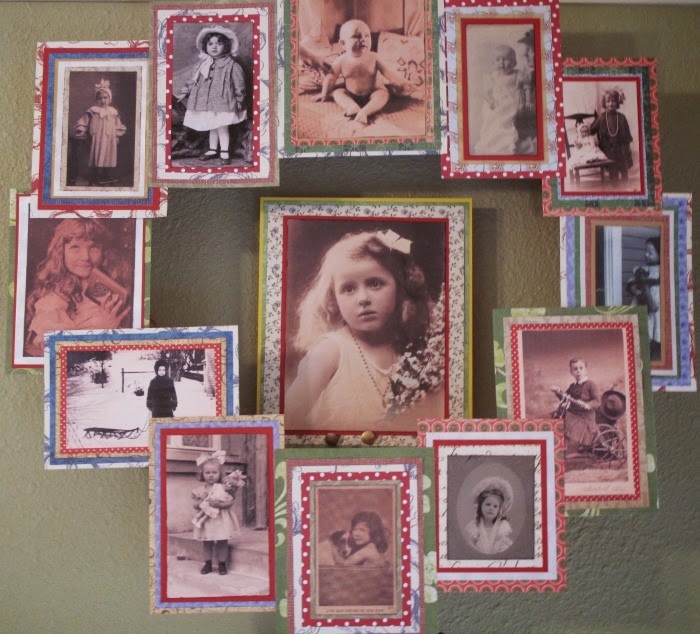 I chose to cover the trellis tree in vintage child images I printed off the computer. It would be my tribute to the children missing or long dead. It would symbolize the ones who, through no fault of their own, would never come home. The clocks on the trellis tree represent time cut short. It signifies innocence that was viciously and brutally violated. All because they happened to be in the wrong place at the wrong time. I brought in a plant stand from outside, and nailed my trellis tree behind it in my dining room. I sewed three little stockings and added buttons. Then I trimmed the plant stand with vintage pot holders and tucked in a few ornaments. Inside the plant stand I laid teddy bears on an old quilt. 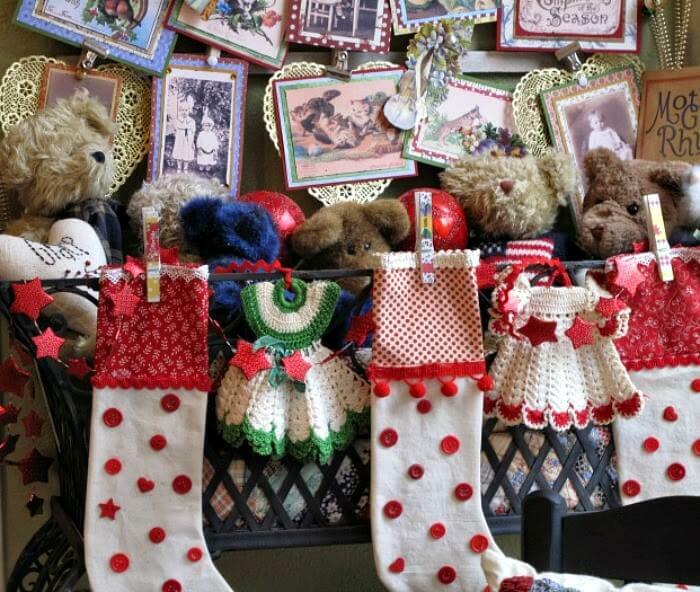 The teddy bears are much like the stuffed animals that were lovingly laid on their bed pillows by family members. Obviously still hoping they might come home one day. One thing I learned was that the bedrooms of these missing or murdered children never change. Dust sits on the surfaces. But the parents are loath to change the rooms at all. That to me was the most haunting thing I remember. Still in my head are the softball trophies of a missing 13 year old girl. And the stuffed animals on the bed of a murdered child taken from school grounds after a football game. It is these memories that stick in my mind. These unfortunate children who had a whole lifetime ahead of them. Their promising lives were cut short by some psychopath who cared not a whit for human life. I will never forget these children, though it has been many years since I wrote about them. One article I wrote was about a 12 year old girl who was snatched from a crowd after a football game. After my writing was finished, I decided that I wanted to visit the cemetery were she was buried. It was my way of ending things so I could move forward. It was the period at the end of a sentence that would never be commuted. The assistant district attorney who worked the case went with me that day. He put the man who killed her in prison. It was cold and the wind blustery that long ago day, I recall. He stood before her grave solemnly. I could see that his emotions were getting the best of him. I turned around and walked away to give him a bit of privacy. As I walked, I began to hear the sound of Christmas music. I stopped and tried to pinpoint where it was coming from. I realized then that it was coming from the murdered girl’s school, which was nearby. The school band was playing holiday music that morning. The wrong notes that crept here and there in made me smile. I motioned the district attorney over so he could hear the music too. I hope this does not sadden you too much to read this. 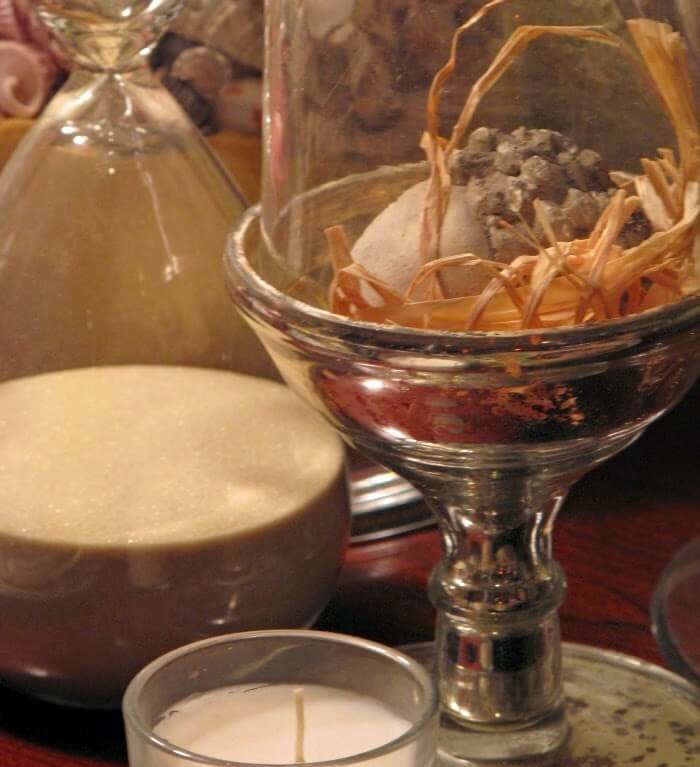 I know this is the Christmas season and that should be a joyful time. I did not write this to bring your spirits down. But to remind you to be thankful for all that you have. I wrote it to remind you to hug your little ones close. Maybe on Christmas you will think of those parents and perhaps even light a candle for them. A simple white trellis turned upside down to resemble a Christmas tree is my tribute to them all. The children that never come home or grow up. This post was written for the Holiday Thrift Store Challenge blog hop organized by Alice of Thoughts From Alice. 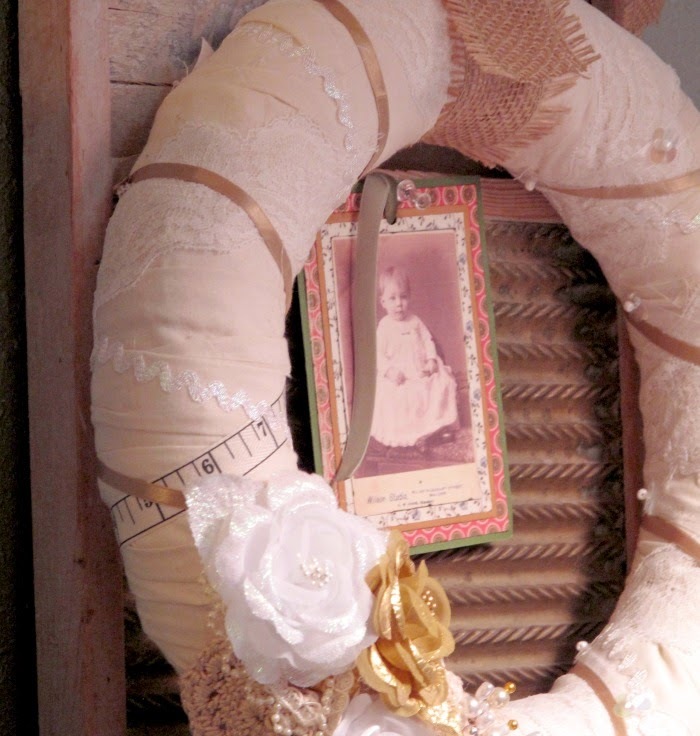 Click the links below to visit the other participants in Alice’s blog hop. 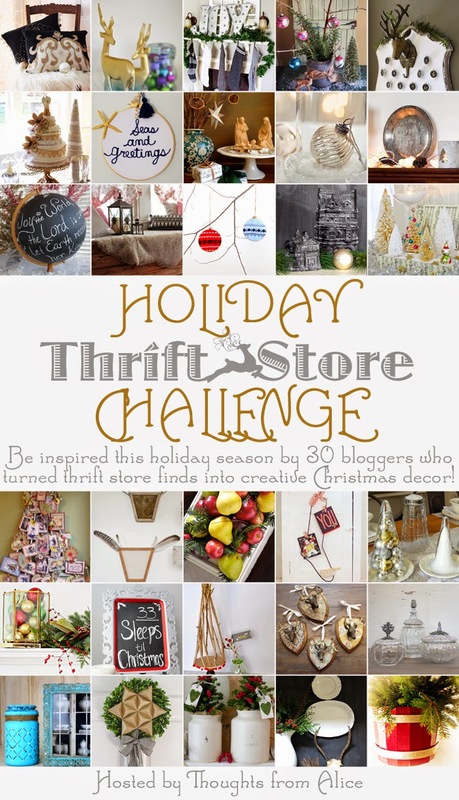 There are a lot of talented bloggers out there that have taken the Holiday Thrift Store Challenge. I can’t wait to see what they have come up with. Oh Brenda, so heart breaking to even think about. It had to be so difficult for you to write these stories but you were doing a good thing to make people more aware that these things do happen everyday. Your words really hit home with me when you mention the softball trophies and the 13 year old girl – my daughter plays softball and will turn 13 in a few weeks. I think I will be giving both of my kids extra big hugs today! They were difficult to write. But I felt they needed to be written. The problem is in letting go after it's been published and time moves on. Somehow they stay in your head. I guess forever. I studied psychology and social work in college and the plan back then was to work with abused/neglected children or along those lines in the field. The stories that I heard during my schoolwork and on the news would stay with me for weeks…months. Many to this day. I consider them part of my "collections" in my heart…of stories of children that I will never…can never…even if I wanted to…forget. They are a part of me now. As are yours. Your trellis tree on the surface is so charming and creative and the deeper, thought provoking meaning behind is a valuable reminder to all of us about the loss and lives of the children who didn't get to spend another Christmas with their families. I was so moved by the part where you heard the Christmas music in the cemetery…thank you for sharing this and taking the challenge with me Brenda. It was truly an honor. I don't mean to bring anyone down during what is considered a jubilant season. But I also don't want people to forget the lives cut short, even if they just think about it while they read this. They should not be forgotten. It would be an even worse crime if they were forgotten. He won't know why. But you will. And everyone can use an extra little squeeze called love. Yours is the only post I have visited from this hop today, that brought tears to my eyes. What a special tribute. There is a dear lady in our community who just this week lost her college-age son to a "random" act of violence. He was buying something at a convenience store when his life was brutally taken. I can't begin to imagine what she is going through. Thank you for honoring these beloved, unique lives that are dearly missed. These crimes seem to be "acts of opportunity." They pick a child out of the crowd. No one knows why they pick a certain child. Thanks for sharing Brenda! Love this project and thanks for sharing your story. I share it for those children and their families, to give them a voice. Even many years down the line. Beautiful tribute to precious young lives! Every young life is precious. But to a child killer, life is nothing. They only think of their needs and what they can use that child for. It is reprehensible. But we can't stop it, for it is so random. I guess as with everything, there is the other side of the coin. Children should be happy at Christmas. But I don't think it should just be about how many toys they get. After awhile, it is just a glut of possessions. I think they should also be taught that life is quite precious, in whatever way you can tell them that they will understand for their age. I guess the memories in my head will always haunt me. But that's okay. I've got a lot of room in my head for such things! It is haunting. But it is nothing compared to the parents that will never have closure, and never know where their child is or what happened to them. To me that is hell on earth. Oh my. I don't think I could ever work in that capacity. I'd be too haunted by the evil. It's just the worst thing I can imagine as a parent. There are many things I can't do. But that was one thing I could do and seemed to have a talent for. I think we should use our talents. I am not just a woman who decorates & gardens. We are all many things. And if that particular talent is why a mother would read the copy before I sent it in and say: "Thank you for doing this for my child", then it is well worth it. So very sad, so meaningful too. Praying for all those parents who never had the opportunity to see their child grow up and praying for you too Brenda for having to endure all that sadness. There is sadness all over. Homeless people crouched on the sidewalk. Children without coats to keep them warm. It is a sadness that I willingly took on, because I wanted those children to be more than a case number. i love the thought and sentiment behind this tree. i can't imagine never having closure if my child went missing. beautiful work. I don't think anyone could imagine it unless it happened. God forbid that it does. by far the lovliest tree created from your warm and loving heart and the memories you spoke of. It may not win any contests but its depth and wisdom make it No. 1 in my book. I thank you for sharing with us this heartfelt post and I wish I was media savvy enough to spread it around so many could read your words. They are a GIFT and need to be shared with as many as possible. These stories are all over the media for a time, and then they are usually forgotten. But the parents' torment lives on. I write this for them. What a beautiful and touching tribute to those children. 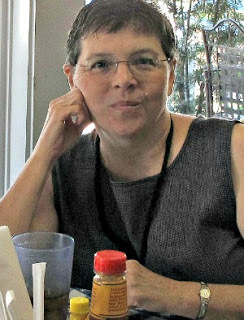 My best friend was murdered when we were nine years old and there's rarely a day, even 47 years later, that I don't think of her. She would love your tree. Brenda, you have such a big heart and this is a lovely way to express memories of those that should never be forgotten. I am an intense person when it comes to emotions. I guess that's why I chose to write what I did. Because I knew I could channel that intensity and make the story come alive for others. Not so it would haunt them. But so they would remember. What a beautiful tribute you created in memory of these children. It is so heartbreaking to hear and how hard it must be for anyone who has suffered through this. This is such a wonderful way though to show your love and strength. What it is for me is nothing to what it is for those parents who still wait for closure, and the child would be an adult now. The stories like the case where the girl was found and had two little girls by the monster are few and far between. And even though she and her girls were found and he is in prison, she will be in a prison of sorts in her mind for the rest of her life. I'm glad to hear that you wrote this for a blog event because that might mean even more readers will see it than the many who often visit this site. 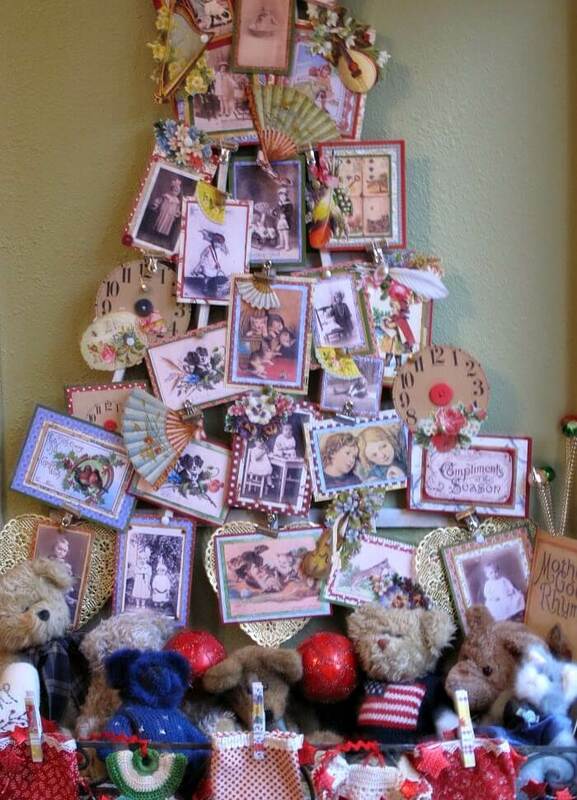 Your story and the photographs of the tree and wreaths are so heartfelt and meaningful. Have you ever seen Christmas tree decorating competitions at the mall? To me, this theme would be a great one for such a tree, so that many people could be touched by the message. I know some must wonder why I write about such things. But I write about them because they are chapters in my life, and they aren't in most. I just want those who read to stop and perhaps look at photos of missing children, and realize that Christmas is a thing of the past for them. I would never want to have a child read this and be haunted by it. But their parents need to be very, very cautious about putting their children on social media. Because there are predators out there, and I can promise you most have computers. The meaning behind this tree is priceless. The best gift you could possibly offer these children and their families is to know that they are not forgotten–you have done just that by creating this beautiful tribute. I always want to give them something, but I can't possibly mitigate their suffering. So I do what I know. I write. OH, Brenda. If ever there was a special tree ….no words. Not going to even try. My simple trellis tree had a lot of meaning for me. I cried as I added those images. For in my mind I saw real children's faces that I never got to see alive. I know beauty is in the eye of the beholder. Some people may read and think: why such a story now, during such a beautiful season? Because there is always the flip side of the coin, and I hope no one who reads this has to live it. But giving it homage is a gift they can give. Brenda, what a beautiful tribute! I think child predators are the worst. How could anyone do things like this to children? They are so innocent. The trellis tree is such a creative idea. You have to remember that these predators are not like you and me. They have no conscience. I don't think there is a point in ever letting them out of prison, if society is lucky enough that they are caught, because I don't believe there is a rehabilitation for them. I don't think you could ever kill this sick instinct they have. Heart wrenching – but a sensitively expressed reminder that there are other things going on beneath the surface amid a season otherwise full of self indulgence and carefree joy. You have such a beautiful and compassionate soul, Brenda. Heart wrenching, I know. But I just don't want them to be forgotten. Your tribute to these children and the families is one of the most beautiful things I have ever seen. As a teacher I have experienced the death of students; some from disease, some in accidents and one murdered. You never forget them. No, you don't. I know I will never forget them. Death due to something like this is so very hard to even imagine. You will never forget them, and I guess that is good. Not to be haunted by it. But to be cognizant of it and to be ever more vigilant in a society where everyone is obsessed by social media, and children are, unfortunately, splashed all over the internet. Back when I was writing these stories, that wasn't the case. I can only imagine that now, predators have everything they could possibly want right there on a computer screen. Where they can pick and choose so easily. I have to agree with Deb up above……no words! Words are not necessary. To read it is enough. Count me in with Deb and Nancy. No words. We see these things happen, we hear it on the news, and one has to think: Thank goodness it wasn't my child. And that is not selfish. That is part of our survival instinct. The tree is such a loving tribute to the children and their families. I don't know how people go on after losing a child, marriages, work, etc have to be resumed, the agony of it all. When I was reporting in Superior Court, one of my first cases I worked on was the killing of a little boy 4 yo by the mother's boyfriend. After I did that I said I don't want to do any more child murder cases. The years went by and I didn't come upon one until a friend got a murder case in her court. She asked me if I'd help her out, and I said only the opening and closing statements, not the testimony. I'd had an adopted daughter the same age as the little girl and I didn't want to hear the testimony. The boyfriend pushed the 3 yo daughter of the mother down the stairs. In both cases it showed how they'd been mistreated with bruising and trauma. Sometimes when I least expect it they cross my mind and I wonder about the children, how old they'd be, what they'd be doing now. Some of those memories just don't go away for us. What a unique and lovely thing for you to do. I cannot imagine the loss those parents must bear. I was blessed to have my oldest son with us until the age of 43 when he passed; and I am blessed now to have his younger brother living with us for a while. Enjoy every moment with your children no matter their ages or what temporary grief they may have brought into your pristine life. Their lives are precious and a gift to you as a parent. Wow, what a hard and powerful story. I love that you paid tribute to them and you remember the families so! Amazing project! I love your tree idea. And I also like the story you shared. It's always very difficult when a child dies, but the way you managed to show hope is wonderful. In one of the schools I work in, a pupil died a month ago. Even if it's hard, I felt my very first job as a teacher was to show my pupils that life was going on for them. What a powerful post. Parents never seem to lose their grief from the death of a child. From the people I know who have lost children through a variety of ways, it seems there is always a current of sadness just below the surface. Yes, they go with their lives and experience joy, but they always remember their loved one. What a wonderful way to repurpose a trellis. Brenda-I love what you've done with a simple trellis, and I love the purpose behind it. I think it's important to reflect on deeper, even heavier, things in blogland every so often. You've created a beautiful tribute -thank you for sharing and reminding us to hold our children close today! Tweeting. I have visited your blog today and touched on a few of your posts. You are someone I looks forward to achieving your skill, with my voice on my blog. I love the creative way you look at your home. There is one more thing that you do that I am Thankful for and hope to pass it on as I grow. You give a chance to the new ones of this passion so many of us share. Thank you again for supporting your peers. This is a very touching way to remember and honor all of those children and their stories, Brenda! And it's definitely an important message, even if it can feel "dark" at such a celebratory time of the year. All the more reason for us to gift to charities and organizations that help children and families in dire situations, so that they can enjoy the season in the same way that so many of us do! Love the little fan decorations! Where did you find them?